Family medicine residents who graduate from Federally Qualified Health Center–aligned Teaching Health Center (THC) training residencies are nearly twice as likely to pursue employment in safety-net settings compared with non-THC graduates. This trend has been consistent over the past few years, suggesting that the program is fulfilling its mission to strengthen primary care in underserved settings. The Teaching Health Center Graduate Medical Education (THC) program provides funding for residency positions that emphasize community-based training to address health care workforce needs.1 Currently these positions are filled by over 700 medical residents in 57 programs in Federally Qualified Health Centers (FQHCs) across the United States.2 A previous study of graduating Family Medicine (FM) THC residents found that, in 2014, 32.7% of THC residents intended to practice in safety net clinics, as compared with 17.8% of non-THC residents.3 This brief expands that analysis across 3 years. Using data from a 2014 to 2016 questionnaire required of all graduating FM residents when registering for the American Board of Family Medicine certification examination, we identified graduates of THCs and where they intended to work after graduation. We then classified practice sites as safety net settings if they were FQHCs, Rural Health Clinics, public health clinics, institutional clinics, or part of the Indian Health Service. Of 9579 graduating FM residents across 3 years, 6182 (64.5%) reported future practice plans. Among the 9256 non-THC FM graduates, 5966 (64.46%) reported practice intent and among the 323 THC FM graduates, 216 (66.87%) reported practice intent. 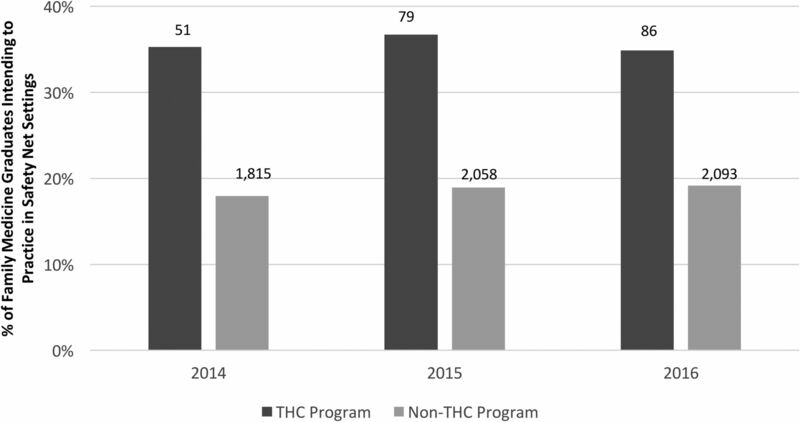 The reported practice intentions for both THC and non-THC FM residents by year are shown in Figure 1. Across the 3 years, an average of 35.6% of THC residents reported intent to work in a safety net setting, versus 18.7% of non-THC residents (P < .01). Percentage of Family Medicine Residency Graduates from 2014 to 2016 intending to practice in a Safety-Net Setting after Graduation. THC, Teaching Health Center. These findings suggest that the THC program is producing a cohort of family physicians likely to increase access to primary care services for vulnerable communities. Our findings are well-aligned with recent statements by both administration officials and the National Academy of Medicine, emphasizing the need for value and measurable outcomes from federal investment in graduate medical education.4,5 However, the program is small and remains funded on a short-term basis, which leaves it perilously close to disappearing without a sustainable policy strategy for its long-term existence. Conflict of interest: Dr. Peterson is an employee of the American Board of Family Medicine. To see this article online, please go to: http://jabfm.org/content/32/2/134.full. Received for publication October 2, 2018. Accepted for publication December 30, 2018.